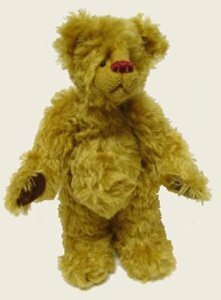 12", Gold dense long German mohair, shaved face with a red colored thread nose and mouth, German black glass eyes, chocolate merino wool felt paw pads with red thread claws. Needle sculpted face and paws. Fully jointed, softly stuffed body and firmer stuffed legs and arms. Tag signed and dated by Leeann.